SPOLIER??? : I was talking to Jeff a few minutes ago and we were discussing the up coming X-Files/Millennium crossover. The thought occurred to me, what if the Syndicate works with the Millennium Group? What do you think? REMINDER#1: Today "The Beginning" will be re-airing on FOX @ 9pmEST. REMINDER#2: Today is David Duchovny's 39th birthday. We hope you have a good one, David. FIGHT THE FUTURE: No, this is not about the movie. It's about this site. I see the future and it looks busy . I am afraid that I will not be able to keep this site as updated as I try to do. Therefore, I am thinking about just keeping this site as The X-Files Archive. It'll be like an encycolopedia. What do you think? Please vote, and try to email me or sign the guestbook or messageboard with your thoughts. Thanks. NEW LINK! : Jeff's X-Files Page is one of the best! It has a Lone Gunmen Newsletter, games and various other goodies! This site will be added to the links page. 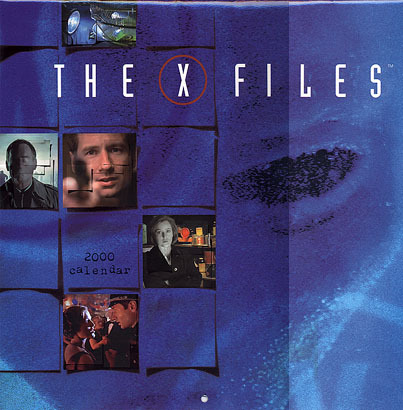 "The X-Files" wall calendar for the new millennium (Y2K) is now available. "The Beginning", "The Rain King", "Two Fathers", "Drive", "Dreamland", S. R. 819, "One Son" (2), "Triangle", "Tithonus", "Milagro", and "How the Ghosts Stole Christmas". 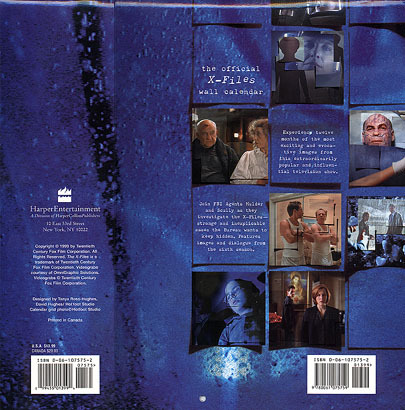 click on the thumnails to view larger pictures of the front and back. Gillian Anderson was recently featured in last weekend's Canadian newspaper, The National Post. For pictures and the article, click here. This will later be added to the articles/reviews archive coming soon to the site. "Mimi Rogers was also in Austin Powers... which was really funny because it was as if Diana was in a black leather suit. I got some weird looks when I started laughing for apparently no reason. ^.^"
Mimi Rogers has also appeared in the sci-fi movie "Lost in Space". OLD NEWS: a new section has been added to the site because we're getting a lot of news. click on the old new link on the left to look get that nostalagic feel. Duchovny Loses Lawsuit: read the article here! David Leaving XF and Gillian staying? The rumours are circulating. Check out an article here.Gillian Anderson is on the cover of this week's (July 31 - Aug 6, 1999) Canadian TV Guide. She, as well as David Duchovny are named as two of "TV's 12 Sexiest Stars". Ooh l� l�. TOMORROW! : Meet "Science of the X-Files" author Jeanne Cavelos. She will be signing her book and answering questions on August 5th at the Smithsonian Institute, Washington, DC, 6-7:30 pm. for more information, go here: http://www.sff.net/people/jcavelos/xf.htp." FX will start airing on Direct TV in the first week or two of August 17th. "The X-Files" will be aired on this new station. The upcoming US season of The X-Files may well be its last, with the contracts of both David Duchovny and executive producer Chris Carter due to expire in 2000. Adding fuel to the speculation is Carter's reaction to the show missing out in this years Emmy nominations list. He says he was "kind of disappointed" and is planning to write the next 22 X-Files episodes as a "wrap up". Meanwhile carters new sci-fi series, Harsh Realm, has been previewed to the American press. He says a virtual reality war scene in the show was inspired by Steven Spielbergs W.W.II epic Saving private Ryan." REVIEW: The Snow Files, a compilation disc by Mark Snow was released May 11, 1999. Read a review here. October 31: X-Files' Season Seven PREMEIRE on Halloween! Who's the sexiest? David Duchovny or George Clooney (ER)? Cast your vote at TV Guide. The premiere, will air on October 31, 1999 @ 9pm EST, as we all know. Filming for this episode occurred on July 19, 1999. Birthdays are coming up: David Duchovny will be 39 years old on August 7th. Gillian Anderson will be 31 years old on August 9th. Congratulations Gillian! : Gillian Anderson was nominated for an Emmy in the Best Dramatical Actress category. Gillian has won and been nominated for various past awards in this category, as well. The WEST team won in the World Improv Championships (which oddly enough only involved Canadians.) There is a chance that this "sport" will become an annual event. The pictures done by Cliff Nielsen are up. I haven't put the link in the MISC PICS section yet, but here it is from here: AIR-BRUSH ACTION. CHANGE OF DATE! : The final season premiere of our favourite show will be a week early! This long anticipated episode will air on Hallowe'en night so get out your costumes! (and your baseball gloves, because it'll air after the World Series). Dean Haglund was on the World Improv Championships Thursday night. He was a part of the West Team (from the west coast of Canada). The West Team was competing against Quebec in the semi-final and they won 7-5. Both teams were equally hilarious, and if anyone from Toronto watched it (at 6:00pm to 7:30pm EST on the Comedy Network), I'm sure you would agree that the "bus bit" done by the West team was a highlight. (The psychopathic bus driver was taking people from Montreal to Hell: Toronto). Tomorrow final match between the West and the East will take place. The World Improv Championships are broadcasted live from Le Medley, in Montreal. The game airs at 6:00pm to 7:30pm EST on the Canadian Comedy Network. The Mulder, Scully, Skinner, CSM and Krycek biography pages are up with pictures. The biographies will be filled in soon. More biography pages will be up tomorrow. NEW WORD: SKipper = A shipper who wants Krycek and Scully to get together. Some "regular" shippers are upset about this...hehe. This will be added to the glossary. X-Files' artist Cliff Nielsen was featured in an art magazine called AIR BRUSH-ACTIONin April 1999. Nielsen is an amazing airbrush artist who has done beautiful work in and around the show. I'll have pictures up within the next two days. Frohike/Tom Braidwood Fans! : Tom Braidwood will be staring in a 30 minute film that was/is shot by trainee assistant director Patrick Stark. The film is a documentary on the Vancouver crew which was left behind when 1013 Productions moved to L.A. I'll have more information tomorrow. Krycek Fans! : If you don't already know this, Krycek/Nick Lea was featured in the summer issue of the Official X-Files Magazine. Try to look for a copy if you like pictures, but be warned...there aren't many out there! Good luck! Most pictures in the Miscellaneous and the Fight the Future section are fixed. We finally made it online! There's a hugeupdate tomorrow to celebrate and...because there's always news. Possibly the best mythological episode, "Redux II", airs today on channel 2 in the USA and Canada at 7pm.